We put together an e-book on Amazon to help you get your head around chartering a yacht or catamaran. Always wanted to charter a yacht abroad, but not sure how to go about it? Or been too scared to try and book anything? Or worried about not knowing what you’d do if you crashed a boat whilst abroad? If you answered yes to any of those, then we might just have the guide for you! 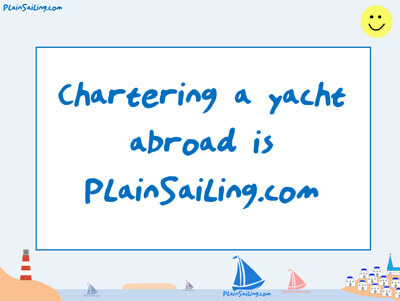 Our team at PlainSailing.com have all put our heads together, pooled over 120 years of sailing experience, and written a super-handy guide – “Chartering a Yacht abroad is PlainSailing.com” – which explains exactly how it all works! From choosing a cruising ground, to locating a marina, and working out what size and type of boat you will need, to working out where to go in your new home, where you can anchor, and even what to you hear a loud CRASH noise at sea – it’s all covered in this guide! And as well as answering all your questions, there’s a section where we talk about what we did on our last amazing sailing holiday (in Croatia), talk about how much it costs (it’s a LOT cheaper than you think! 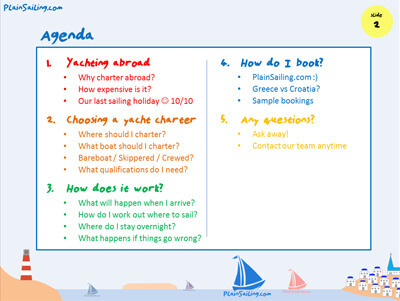 ), and give you loads of reasons for why sailing abroad is AMAZING! It was actually written to be presented as part of our PlainSailing.com Roadshow in 2017 (We visited six Yacht clubs across the UK), but we think it’s so useful that, if you want to read it (or present it at your yacht club!) then drop us an email and we’ll get a copy to you (it’s a whopping 12Mb). You can have a look at the PDF hand-out notes here.